Should the Jaws of Life Cost a Fee? 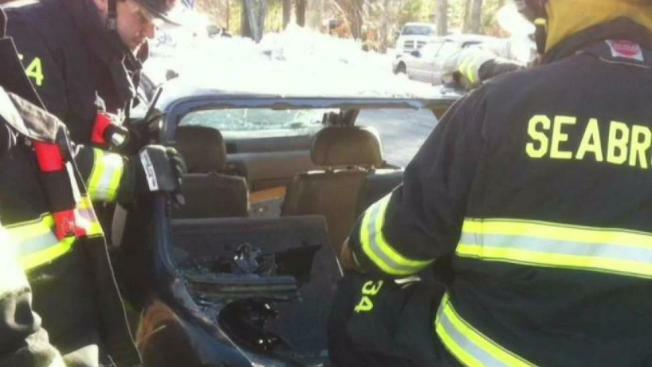 The chief of one New Hampshire fire department has requested a fee for the use of the Jaws of Life. The Jaws of Life are a critical piece of equipment firefighters turn to when someone is trapped inside a car. In Seabrook, New Hampshire, it's only used a few times a year, but the fire chief has requested that a fee now be charged each time someone is freed from a vehicle and the device is used. "I think that it's ridiculous, and that saving lives should not be so costly, and that's part of the town's expenses and they should incur that," said Kathy Lambert, who works in Seabrook. Seabrook's Board of Selectmen voted to approve the fee this week, but now it's on hold. If the fee is eventually implemented, the plan would be to bill the auto insurance company $500. If someone doesn't have insurance, the fee would be waived. "The chief's intent is to try to take some of the onus off Seabrook taxpayers and put it on users," said Town Manager William Manzi III. "Whether this particular fee is a good idea, I think, is a very fair question, and one that the board continues to examine." Frank Doyle, senior vice president at AAA Northeast, says the fee would likely be passed along to policy holders in some form. But he adds that getting someone out of a trapped car quickly could perhaps save money in the long run, by reducing medical bills. Manzi is researching the fee and will report back to the Board of Selectmen in January, but at this point, he thinks it may not pass this time around based on some of the negative feedback he's already getting from Seabrook residents. Still, some are supportive of the fee. "I don’t think it’s a bad idea because it’s an expensive piece of equipment and it does cost a lot and they wear it out and they have to replace it,” said Seabrook resident Jean Simonson.